With the UROMED catheter valve, your patients can regulate bladder function themselves – by urinating at the push of a button. In this way, you can give your patients with permanent catheters much more mobility and independence. Due to their ergonomic shape and light weight, the catheter valves are inconspicuous on the body and therefore lead to a high acceptance rate among your patients. The easy-to-operate UNIVERSAL CATHETER VALVE REF 1500 FROM UROMED can be operated with one hand and closes automatically after releasing. With the aid of the integrated slider, urine can be constantly diverted into a urine bag. Reliable and fast adaptation of a CYSTOBAG drainage system via the UROMED CATHETER VALVE ADAPTER REF 1505 prevents unnecessary manipulations of the catheter. Both components are also available in the REF 1501 set. 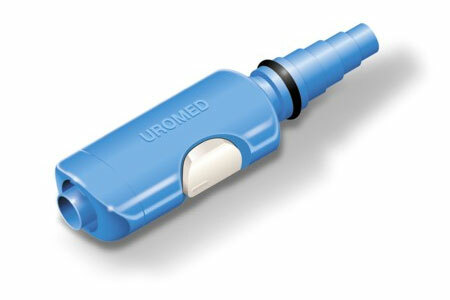 The UROMED COMPACT CATHETER VALVE REF 1504 can be used if you do not wish to connect a urine bag. It does not contain a sliding mechanism for a permanent opening. With the UROMED catheter valves and urine drainage systems, we offer your patients the right product for every requirement. The products can be prescribed as special aids – and will not strain your budget! 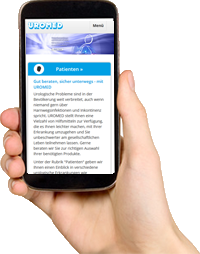 Prescribed products can be conveniently delivered directly to your patient’s home – in a timely and discrete manner and reliably tailored to the period you specify.